Over the last week, I sipped and tasted three wines from Bodegas Trivento, a Torrontés, Cabernet Sauvignon and Amado Sur. I am reminded of my wonderful trip to Mendoza last fall where I had the opportunity to visit Trivento and meet some of the people that create and produce their fabulous wines. Reviewing my notes, I discovered I had sampled all three. Revisiting them now in the intimacy of my home had a more lingering impression. My memories of visiting the winery and the amazing luncheon I had overlooking the vineyards that make these wines special. 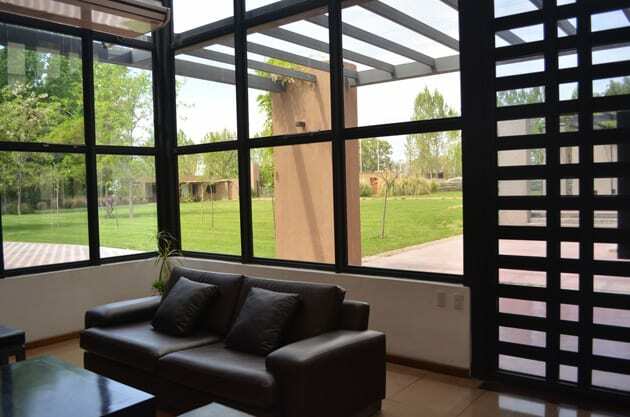 Bodega Trivento is comprised of the winery located in Maipú and eight vineyards that include three in Uco Valley, one in Luján du Cuya, one in Maipú and three in the East. The winery was established in 1996. Since that time Trivento has expanded to become a winery that is recognized all over the world. Trivento means three winds. It represents the winds that affect the vineyards in Argentina. They are the Polar, which come in from the south announcing winter and indicating the time to prune the vines. The Zonda comes in from the Pacific and makes its descent from the Andes. It is a hot and dry wind that reinforces the budding on the vine and is a clear indication that watering must increase. 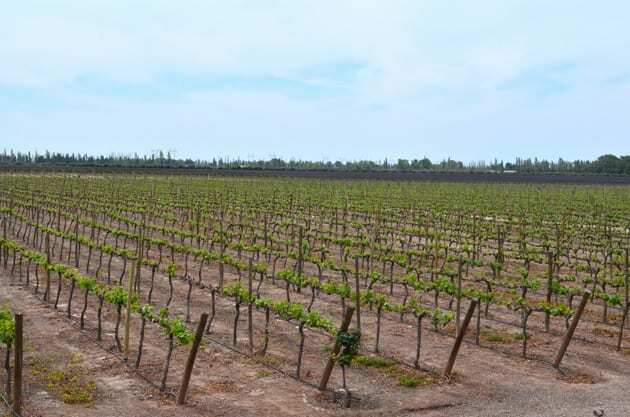 Finally, there is the Sudestada, a southeast wind with cool and cold breezes that can often lead to a summer storm that invigorates the grapes. These winds play an important part in the expression of the land and the growing of grapes thereby leaving their mark on the wines of Trivento. 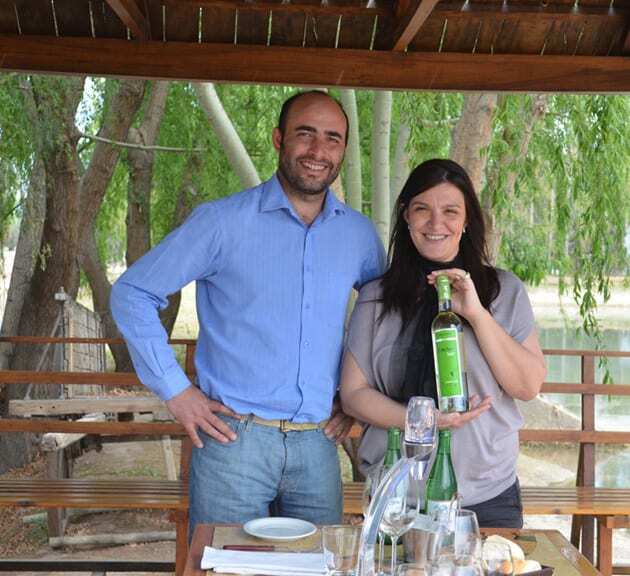 On my visit to Trivento, I met one of the winemakers, Germán Di Césare who took me through Trivento’s portfolio of wines. Both Germán and Silvina Barros gave me an excellent tour of the winery. The winery offers some interesting and different activities that enhance your wine tasting experience. Although I did not have a chance to participate, they sounded very inviting. They include biking in the vineyards, Photography classes with tasting and tango lessons in the vineyard. The latter is very popular now in Mendoza. Trivento’s entrance hall features an art gallery, and at the time of my visit, there was an exhibit of Julio Melto’s work. 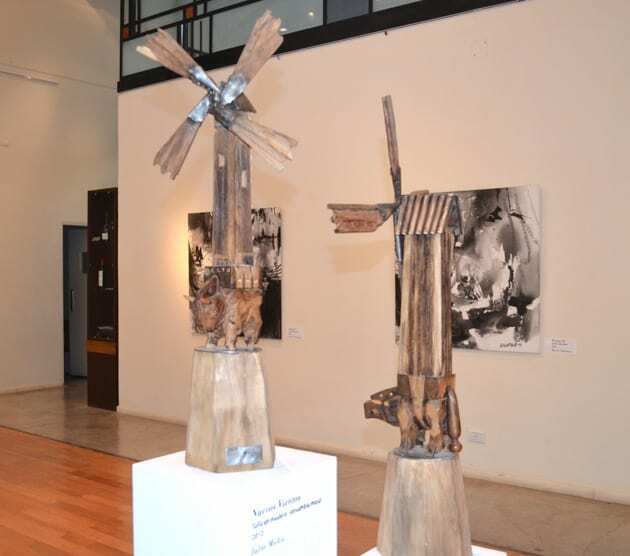 What intrigued me were the windmills because of its relationship to Trivento’s meaning. The wind being an integral theme for the winery made it apropos to have artwork representing this aspect. What impressed me most about the wines of Trivento was their consistency. The entire portfolio of wines I sampled on my visit displayed uniformity in quality. The wines are spectacular in their own way. Here are my favorites. The 2012 Trivento Reserve Torrontés is Argentina’s version of a Sauvignon Blanc. The flavors and aromas are those of grapefruit and peaches. This wine is crisp and refreshing. At the winery, I sampled a 2013 Torrontés. This wine revealed more tropical fruits along with hints of grapefruit and a little spice on the finish. Both wines age in stainless steel for 3 -6 months. 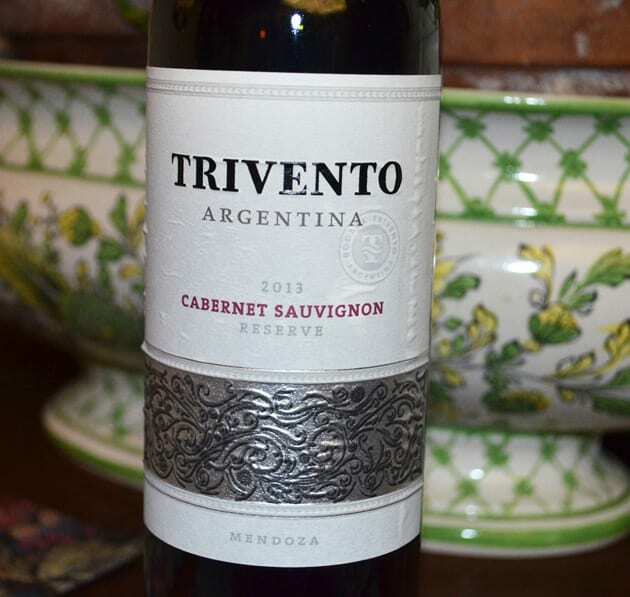 The 2013 Trivento Reserve Cabernet Sauvignon is very fruit forward with flavors of cherry, currants, and strawberry. There is a hint of earthiness while the aromas are a fragrant nose of currants and some vanilla. As my friend Kathleen Bloom, who joined us the night we tasted this wine, said: “ the wine had little bouquet, so I did not expect much but surprisingly found an unexpected vitality and vigor to the wine.” With a hint of spice on the finish, one finds a complex wine. At the winery, I sampled the 2012 Cabernet Sauvignon, and like the 2013, I found balance and a smooth earthy wine with notes of licorice and strawberries. The wine ages partially in stainless steel while 40% ages in 2 or 3-year-old oak for six months followed by three months in the bottle. One of my top choices, the 2012 Amado Sur, blends of 70% Malbec, 18% Bonarda and 12% Syrah. The thick consistency shows off the structure of this big bold wine. The nose is fragrant with aromas of cherry and currant. The flavors are currant and black fruit. A balanced wine, with a peppery finish, this wine needs time to breathe. Like the Cabernet the wine partially ages in stainless steel and part in oak, some in new barrels while the rest is 2 and 3-year-old barrels. At the winery, I sampled six other wines. The most outstanding, the 2009 Trivento Eolo, a Malbec that comes from a single block of one of the oldest vineyards in Luján de Cuyo and also situated on the banks of the Mendoza River. Eolo means keeper of the winds thus it is the keeper of the three winds that inspires the winery’s name, and it signifies Trivento’s finest and most exclusive wine. This wine is mature with its complex structure. At the same time, it is very smooth. 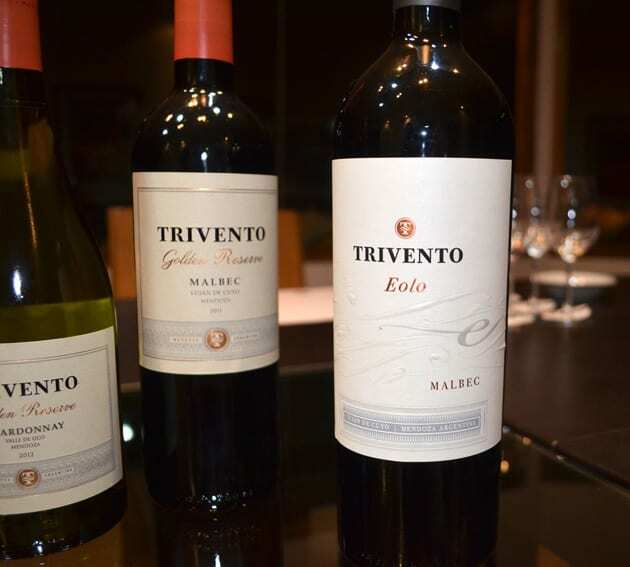 Trivento’s 2011 Golden Reserve Malbec is a treasured wine as it is a master blend of four different locations in the Luján vineyard. The fragrance of the wine is rose and lavender. The Malbec blends with a percent of Cabernet Sauvignon and Petite Verdot. The wine ages entirely in oak, a mixture of new and neutral. I found a nice soft balance with a complex structure. Although the above were my very favorites, the wines listed below merit recognition. The white Amado Sur 2013 is a blend of Torrontés, Viognier, and Chardonnay. The wine has a smoother structure in the mouth, the Torrontés enhances its grapefruit flavors, and the Viognier apricot, while the Chardonnay adds body. The Amado Sur 2013 Chardonnay is accented with a small percentage Pinot Gris and Viognier. It definitely has a Chardonnay nose and is very fresh with tropical fruit and green apple. The 2012 Trivento Golden Reserve Chardonnay displays apple and spice. This wine ages in oak for six months. 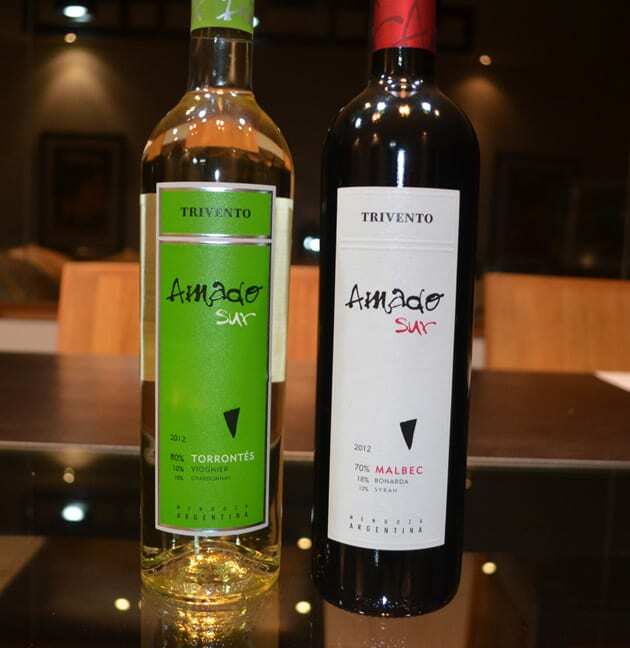 The 2012 Trivento Reserve Malbec blends Malbec from both Luján de Cuyo and the Uco Valley. The wine with its deep purple color expresses a sweetness that is very fruit forward velvety and balanced. 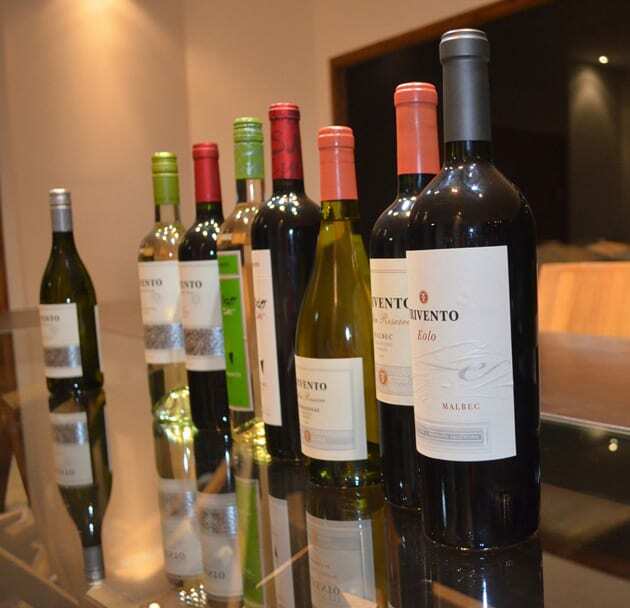 What I found most interesting about Trivento’s wines besides their being inspired by the winds that transcend the Argentine terroir is their consistent quality throughout the portfolio especially after sampling on numerous occasions. The wine was as exceptional in my home as at the winery. You to will discover the even balance of these marvelous wines.